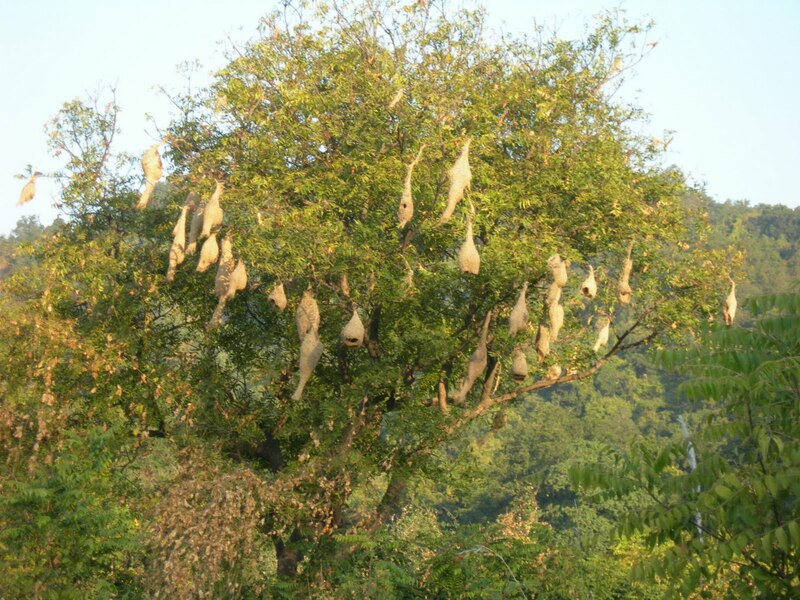 Jim Corbett National Park in terai region of Uttarakhand state in North India is one of the last surviving natural home to Tigers in the North India. 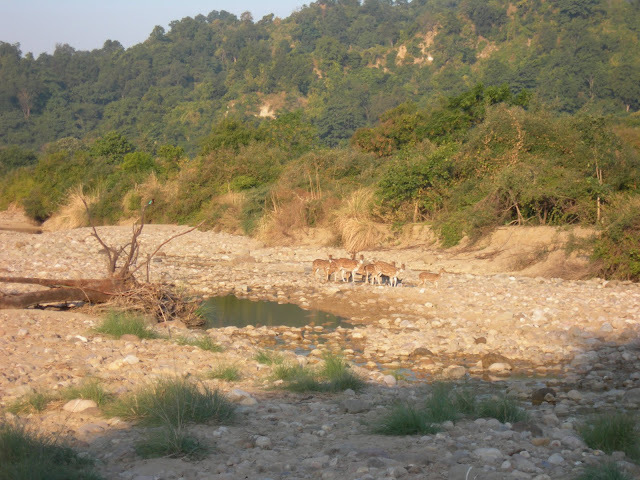 Corbett as the national park is known by both locals as well as tourists and wildlife enthusiasts is a popular destination for both wildlife lovers as well as those looking for a quick get away from the hustle bustle of city. 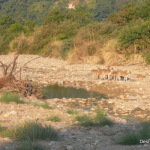 With just about 6 hours away from National Capital Region everybody wants to visit Corbett to see Tigers. 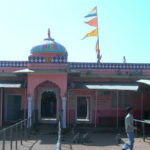 Some travel to see new lands, some travel to meet friends and relatives, some travel to do a darshan of their gods and some travel to come in guineas books of records. But I travel because for me the journey is the destination. Who is in a hurry to reach the destination when the journey is more rewarding than the destination? If Christopher had reached the destination he started for there would have been no IT industry in India and each one of probably would be jobless. Don’t believe me just add Columbus after Christopher and you will be able to figure it out. I hope you believe now that reaching the destination is not important as long as you continue to enjoy the journey. Not too many people would agree with me that is why I keep on travelling in search of somebody who will believe what I have to say. Everybody as their own favourite form of transport some like be high fliers flying between New York, Paris, London and Tokyo, some like to sail the high seas going to new port of calls. I firmly believe that have wheels will drive, I love to drive on the highways and take weekends off to near and far away destinations. In November we decided to drive to the Corbett national park and say a high to Sherkhan the king of Jungle. We decided to go and meet him, what a big mistake that we chose to go without a proper appointment to meet the king of Jungle. Travelling in India on road is one of the greatest adventure, you get the thrill of driving in high mountains, riverbeds, swamps and desert all at the same time, considering the potholes filled with dirty water on our roads. The bonus is you encounter all modes of transport ever invented by mankind. On our journey to Corbett we saw bullock carts, camel carts, tractor trolley, cycle, cycle rickshaw, bus, trailer, trucks, three pointed stars and even a chariot returning from a marriage procession. But the JUGAD gets the special mention, for those of you who are not aware what a JUGAD is it is a diesel engine used for pumping water mounted on a makeshift chassis and wheels used for going from point A to point B. The literal translation of the word JUGAD is workaround and what a work around a JUGAD is I am sure if somebody starts making them commercially Tatas will have to rework on their 1 lakh car. Any ways we reached the outskirts of the Corbett national park in the afternoon and after checking in our room we decided to explore the surroundings of the hotel. 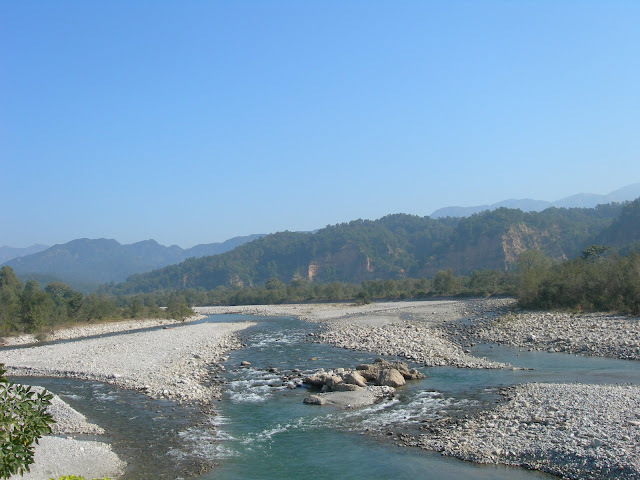 In the backyard of the hotel flows the river Kosi which later goes and meets Ganga. The stretch at the backyard of the hotel for the river was partially stopped by a stone dam and a deep pool of water has formed. In the crystal clear water there was a colony of mahaseers an endangered fish. 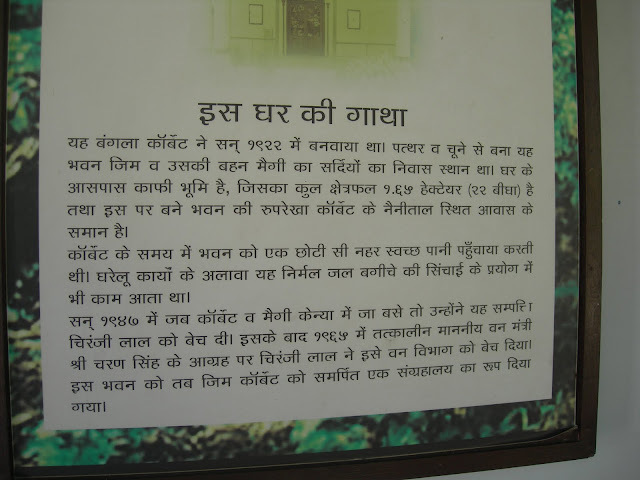 The hotel we stayed was actively trying to conserve the Mahaseer and was making efforts to breed Mahaseer and release them back in to the waters of Kosi. On the stones in the river I could see many birds sitting and waiting for fish. I saw a few kingfisher ( both blue and the rare grey one…where is your telephoto lens when you need it? ), kites, white storks, bulbuls, ravens and a few I could not identify. In the evening a family of peacocks decided to venture close to the opposite bank and feed on the insects in the ground. We counted 3 males and 7 females and more than 15 chicks that were playing blissfully. In the evening we took the jeep to the jungle and tasted the dust for next 3 hours hoping to have a darshan of the king of jungle but with no luck. Our guide pointed out to the pugmarks of the tiger on the dust and even informed how old the tiger is. He even showed us tiger droppings but no tiger. We could see some deer, monkeys, wild boar and even a jackal but no Tiger. Next day early morning we again took the jeep to the jungle but no luck again. In the middle of the river some Deers were standing tense looking in one particular direction. Our guide pointed out that there is a tiger in the bushes and deers can sense it due to which they are tense. We waited for some time but no luck. On our journey back we saw again some pugmarks behind hoof marks of a deer and then some signs of dragging of the deer to the bushes. We missed the action by few minutes but our guide Sanjeev was able to capture the whole seen by his excellent story telling skills. He informed us that the deer was chased by the tiger on the dust path and then he dragged the deer into the bush where he will eat him for next few days. Well all this was making us very exited but the sun was getting warm so we had to return. In the evening we decided to try our luck once again but this time we decided to go on an elephant and not on the Jeep. Our elephant a 40 year old female Luxmi was of very pleasant nature and my daughter developed an instant liking for her and fed her fruits to Luxmi. We entered the jungle on Luxmi with the mahout in front and me, my wife and daughter at the back of the elephant. 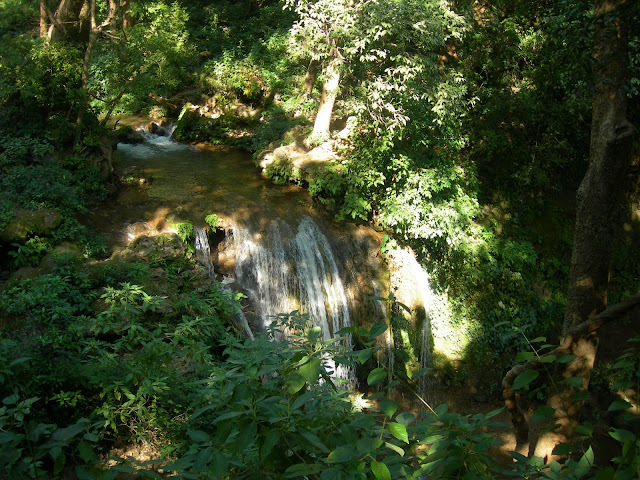 Luxmi took a steep dried up stream and started getting deep in jungle. After travelling for about 15 minutes and stopping only to break some branches to eat she suddenly stopped and her hair on the back stood with tension. 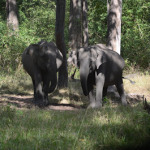 The mahout asked us to keep quiet and tried to listen…suddenly we heard the loud roar of a tiger behind the bushes that made Luxmi more tense and my 6 year old more exited. The roar was travelling from East to west in the bushes and we could make out that the tiger is moving. Very softly in a hushed tone the mahout informed us that this is the mating season for Tigers and the tiger in bushes is a male calling for a mate. We decided to move to a more open area so that we can see the tiger in case he decides to come out of the bushes. After about 3 minutes which seemed like 3 centuries the jungle became silent the leaves and branches of the tree stopped moving the birds that were making a lot of noise indicating the presence of a tiger suddenly became silent as if somebody has asked them to shut down. And then from the bushes emerged the most regal of all beasts in his full glory. First it looked that only some pale yellow branch in the bush is moving but then when the full body emerged we realized that in front of us stood the king of Jungle. He roared again to tell us that he does not like our presence in his abode and we are not welcome. I tried to open my camera but my wife said I should open the video camera instead of the still camera. In this confusion the tiger has come almost 15 feet from Luxmi and she was very tense. The mahout said the tiger due to mating season is not in a mood to pose for photos and we should make a careful retreat. Since he was in control of the elephant we decided to respect his wishes and agreed. The tiger followed us for some 50 meters and then vanished in bushes. We were unable to take any clear pictures. Imagine trying to click pictures of a tiger chasing you when you are on back of a moving elephant on hilly ground with tree branches coming and hitting you every second as you are almost 15 feet above ground on a fully grown elephant. Overall it was a good trip though we were unable to take any pictures of the tiger the memory will be imprinted in my mind for years to come.